- Select Option -Ultra Clear - 4 lb.Ultra Clear - 8 lb.Ultra Clear - 10 lb.Ultra Clear - 12 lb.Ultra Clear - 14 lb.Ultra Clear - 17 lb.Ultra Clear - 20 lb.Moss Green - 4 lb.Moss Green - 6 lb.Moss Green - 8 lb.Moss Green - 10 lb.Moss Green - 12 lb.Moss Green - 14 lb.Moss Green - 17 lb.Moss Green - 20 lb. Choosing the proper fishing line has become quite a difficult task. There are more choices than ever and if you believe all the hype that goes along with them, it gets even more confusing. At GAMMA Technologies we believe that providing a superior product is the only answer. GAMMA has been at the forefront in copolymer filament research and design for over 25 years and is the only company producing a “processed line.” This processing involves patented and proprietary steps that alter the molecular structure of the polymer to produce a line that outperforms the competition. 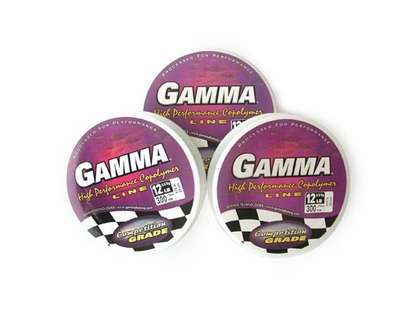 GAMMA high performance line provides the maximum combination of strength, tenacity, castability, and sensitivity. The built-in suppleness and sensitivity characteristics allow for a more natural presentation for both bait and lures while the fighting capability allows more and bigger fish to be landed. Casting comparison tests confirm that GAMMA high performance line casts smoother and up to 50% further than other leading brands. Whether you fish the tournaments or just for recreation, your time on the water is too valuable to be compromised by your lines performance. Choose GAMMA’s competition grade high performance line and start catching more fish! I found this line is kinda non slip in the spool. I like to use as backfill for van staal..
Gamma line is one of the best lines I have used in the last twenty years. Good knot strength is always a plus when out on the water...Limp, strong and just never fails to meet my damands..
ProsA great all around line. great copolymer line. I use it for all applications. 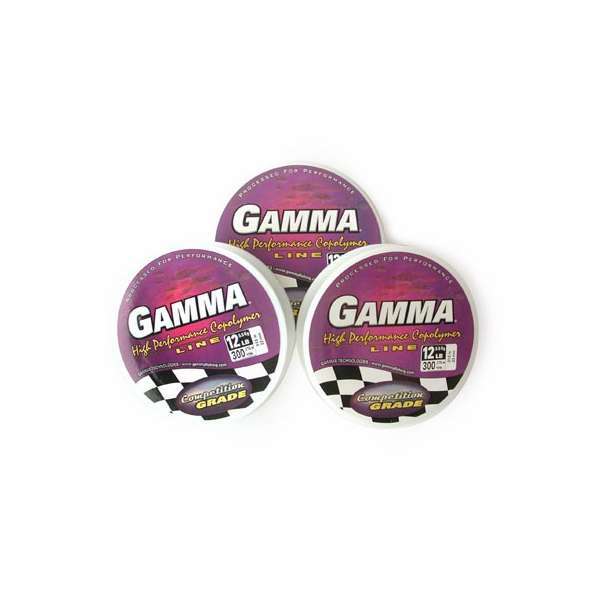 I have used Gamma for years and I love it, It is hard to get in NZ so I ordered 3 spools of different breaking strain from Tackle Direct. The 8 and 10lb Line was good.. Fresh and New. The 12lb lines was half a spool and old and cracked. I still like Gamma but I wont Shop at Tackle Direct again. This looks like a good line for its strength, does this float or sink? The strength is strong, the line is basically a blend a fluro and mono it doesn't sink like floro or float like mono.